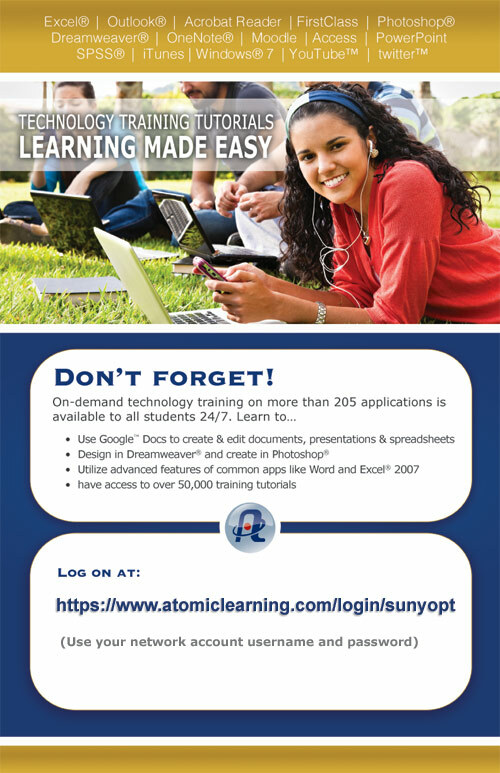 SUNY Optometry has selected Hoonuit (formally Atomic Learning) as an online self-service training resource for faculty, staff and students. Hoonuit is a web-based software training solution for over 100 applications, including Microsoft Office, FirstClass, Adobe Creative Suite, Mac OS X, as well as other specialized software programs. The training is delivered via short (1 to 3 minutes), easy-to-understand tutorial movies (currently over 30,000 in total) and resources that provide personal, on-demand answers to those “How do I do that?” questions. You can log into Hoonuit using your network account username and password. We hope you take advantage of this powerful resource, whether you use Hoonuit for professional development, a valuable curriculum supplement, an anytime/anywhere software training resource or as a helpdesk resource. If you have any questions about Hoonuit, please contact the IT Helpdesk.